My latest original painting. I enjoy looking through old vintage bird prints and came across this lovely creature! I wish the photo captured more of the fine detail. 12x16 on a flat wood panel. (Framing required ) I am continuing in a series of smaller animal, bird fanciful pieces! Thanks for looking! 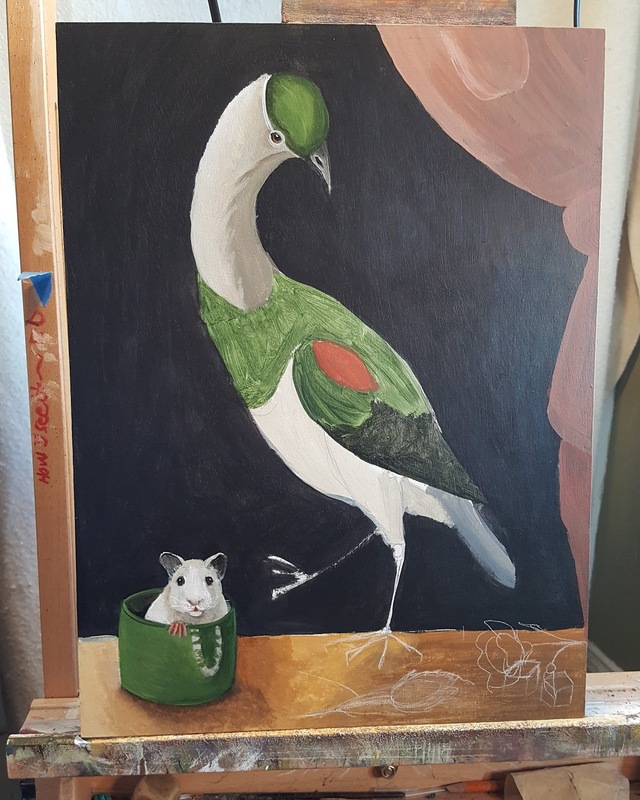 I'm working on another large bird themed piece. 12x16 on a flat wood panel. Completed on 1-24-2018 Driving around with Sam the other day a magnificent Blue Heron swooped down in front of my car. I always consider unusual animal encounters some sort of sign. I like to think it means someone is watching out for us all. Just a reminder . Anyway, that's the idea for this painting. Yes Blue Herons can live near the ocean and fresh water. I am working on a series of smaller paintings for now. Thanks for looking! Completed on 1-19-2018 This is a painting idea I had been thinking about for quite sometime. I decided to work on wood for this one with acrylics and oils. 16x20 with painted sides. I was inspired by one of my favorite painters Matisse. The purple dress I found in a fashion magazine and brought along some of my favorite things to balance out the composition. Happy New Year! This is my first painting of the new year. I decided to work in oils and really enjoyed the process. Things take a little longer working in oils and I had to be more patient! This painting is 16x20 on a gallery wrapped stretched canvas with painted sides. Hope you had a great holiday break and I look forward to sharing my new work with you all. Click the link to view on my website. 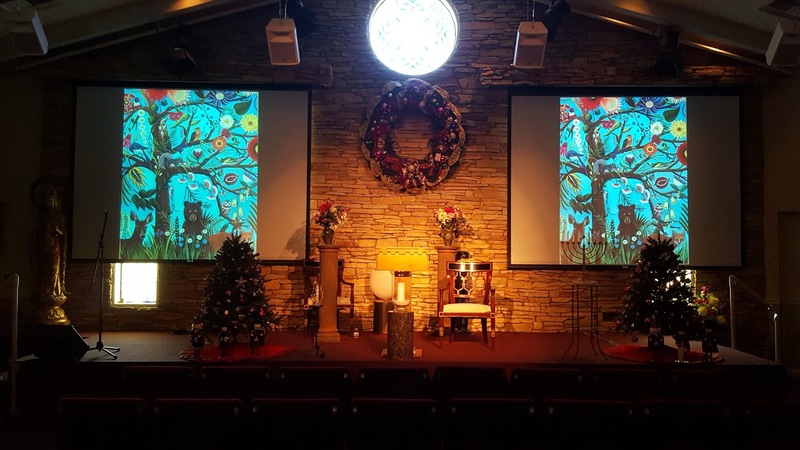 A few of my images were used in a Christmas service L.A. ! The art director from a Unitarian Church in Los Angeles contacted me a few months ago about showing my images as a backdrop to their Christmas service . He sent me this shot which was before the service began. I felt honored my work was selected.